If you were instructed by the tech support specialist to initiate a repair or replacement order, click on the Start button and fill the form. After filling the form, please print it and follow the instructions on it. To update the Lensiora software, locate the yellow and black Lensiora camera icon in the system tray (bottom right corner of the screen). Right click on the icon and a menu will appear. 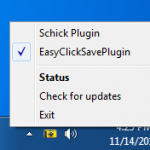 Select the Check for Updates menu item and proceed to Download and Install the update. NOTE: Administrator privileges will be required to apply the update. If you were instructed by the tech support specialist to initiate a repair or replacement order, click on the Start button above and fill the form. Lensiora is warranted for one full year since the purchase date. An additional year of warranty can be purchased when placing the order online. Lensiora comes with a 30 day satisfaction guarantee. If, for whatever reason, you are not satisfied with the camera, contact us to obtain a RMA number and submit an order using the Start button in the return section above. Camera has to be physically intact and have all accessories. Use a soft cloth to softly wipe the camera body. To avoid the need for constant cleaning, use sheaths even when the camera is not in use. Do not wipe the camera with benzene, thinner, Dicide or Glutaraldehyde. If disinfection is required, only use alcohol and avoid the sensor area. When cleaning the cord, disconnect the cord from the camera first! Do NOT put pressure on the connector by running the wipe down the cord while the cord is still connected. This will damage the cord and void the warranty. Do not spray ANY cleaning liquids or disinfectants directly on the camera handpiece or the USB cable. Use care not to allow liquids of any nature to run into the internal circuitry. CAUTION: Avoid pressing too hard or using a sharp instrument to clean the lens. Breaking the lens will void the warranty.